In fifth pAsuram, parAnkuSa nAyaki‘s friend tells a befitting remedy for parAnkuSa nAyaki’s disease. Subsequently, parAnkuSa nAyaki‘s friend says “The remedy you are giving is worsening her disease; you recite the divine names of krishNa who is the eliminator of popular hurdles and apply pure white powder on her”. Fifth pAsuram. parAnkuSa nAyaki‘s friend says “The remedy you are giving is worsening her disease; giving that up, please perform a befitting remedy for parAnkuSa nAyaki’s disease”. This activity for this dhEvathA is not the method to redeem this parAnkuSa nAyaki; alas! her eyes which were dark/large like kuvaLai (blue-lotus) flower and reddish lips/mouth which are like kOvaikkAy (ivy gourd) have lost their complexion and have become pale; (now the remedy for this is) by taking the pristine dust of the divine feet of those bhAgavathas who are reciting the divine names of krishNa, the great benefactor who killed the elephant which ate handful of [intoxicating] food and which has water coming out of it’s trunk etc, and offer it quickly to her (so she can come in contact with it); (the paleness in her body) will be reduced [by doing that]. ivaLAip peRum parisu ivvaNangAdudhal anRu – Those who want to redeem this best entity (parAnkuSa nAyaki), would they do so through this forbidden/lowly means? Engaging in activities to please this dhEvathA will not redeem this distinguished parAnkuSa nAyaki. andhO – alas! we cannot lose her. kuvaLaith thadam kaNNum kOvaich chevvAyum payandhanaL – His [emperumAn‘s] food [enjoyable aspect] is being taken away. As said in periya thirumozhi 3.7.2 “thoNdai am sengani vAy nugarndhAnai” (emperumAn who consumed her reddish fruit like lips) and periya thirumozhi 8.10.1 “maNa nOkkam uNdAn” (one who consumed her glance), these are his enjoyable food. She is said as in periya thirumozhi 2.7.1 “kuvaLai am kaNNi” (one who has beautiful eyes like kuvaLai (dark coloured) flower); kuvaLai flower like eyes which are far larger than any one can enjoy; she is said as in thiruvAimozhi 4.3.1 “kOvai vAyAL” (reddish lips like kOvai fruit); her kOvai fruit like lips (along with her eyes) became pale. Those limbs which did not become pale even in separation from emperumAn, became pale when they came in contact with dhEvathAntharams and devotees of such dhEvathAntharams. When they say “Alright, why don’t you suggest the remedy?”, the friend says “You only said previously in thiruviruththam 37 ‘nedum kAlamum kaNNan nIL malarp pAdham paravip peRRa iLamAn‘ (my young child who was born as a result of our lengthy prayer at the divine feet of krishNa); according to this, you should take shelter of krishNa and be cured by him”. kavaLam … – Two mistakes have occurred here [contact with other dhEvathAs and contact with devotees of other dhEvathAs]; you atone in two different ways to remedy those two mistakes [nAma sankIrthanam and the dust of the divine feet of the devotees of emperumAn respectively are identified as the remedies]. An elephant which had consumed food and had been intoxicated through certain beverages, was placed in front of him. 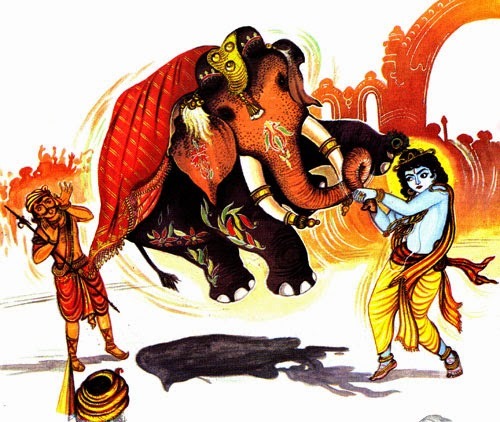 The great benefactor who killed the kuvalayApIdam elephant which had water coming out of its body. You try to cure her by the divine names of the one can effortlessly eliminated the strongest of enemies/hurdles. thavaLap podik koNdu – with the pure dust/powder. nIr – Should not the persons who assisted her in her sinful deeds [taking help from dhEvathAntharams] be now bound to assist her in providing atonement for the same? ittidumin – You apply on her. For her contact with dhEvathAntharam, you try to cure that by reciting bhagavAn‘s divine names; for her coming in contact with devotees of those dhEvathAntharams, you try to cure her with the dust from the divine feet of SrIvaishNavas. thaNiyumE – I guarantee that she will regain consciousness and her original complexion. This entry was posted in thiruvAimozhi, thiruvAimozhi 4th centum on March 5, 2017 by Sarathy Thothathri.